I was so excited to wear the outfit I picked up on a recent shopping trip to Excess Baggage. It's a mix of preppy/edgy (or at least, I'd like the thing so). I've been obsessed with these shorts since I bought them a couple of weeks ago, and have already worn them four times. They're re-worked vintage shorts, so each pair is unique. I paired them with a mint chiffon blouse, and a super cute handmade bow necklace I got from when I swapped bows with Holly Dolly last month. 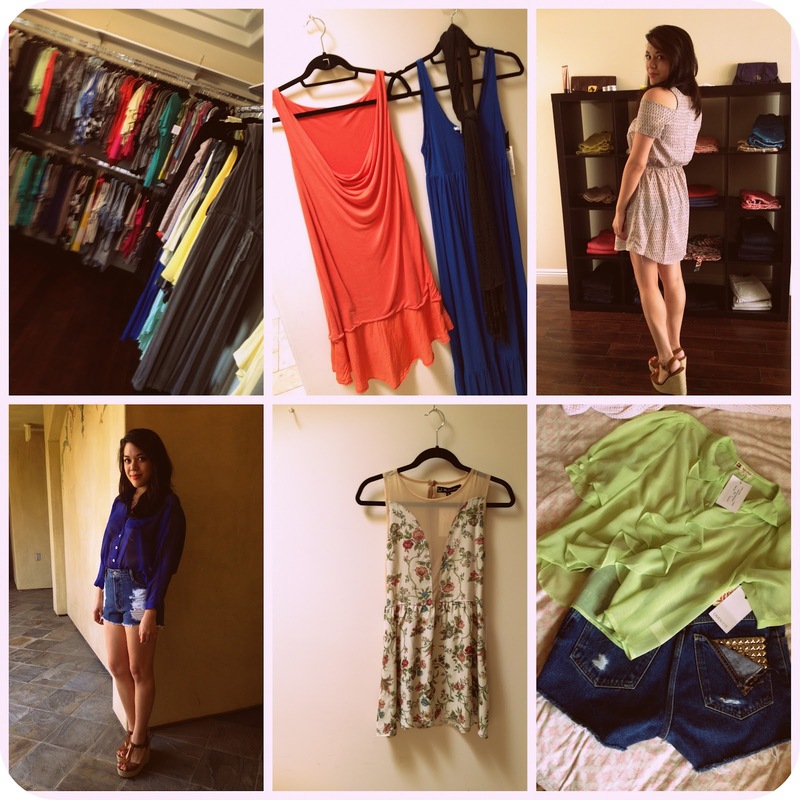 My mini shopping trip at Excess Baggage's showroom in Studio City was a lot of fun. They have a curated selection and mix of trendy and indie brands, all up to 75% off retail! What's unique about them is that you can shop online or in person through personal shopping appointments (at no extra cost). The showroom is a gorgeous penthouse with wood floors and racks of beautiful clothes. Hello, dream closet! My style appointment went really well. Not only was my stylist super nice and helpful, but she made great suggestions when I talked to her about my personal style. When I told her I like things that are preppy and vintage-inspired, she immediately knew at the top of head which styles would work best for me. She even suggested a pair of vintage studded shorts by Omen Eye, which I normally wouldn't try on (I don't usually like frayed/torn jeans), but did anyway because I loved the detailing. I immediately fell in love--I just had to buy them, in addition to the mint ruffle blouse. Photos from my Excess Baggage visit. All in all, I had a wonderful experience and definitely want to visit again. For anyone in the Los Angeles area looking for a unique shopping experience, be sure to make a private shopping appointment at Excess Baggage for great deals and VIP treatment. For everyone else, you can shop their selection online.